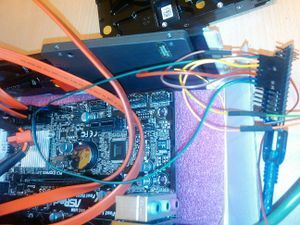 An arduino program to toggle power and reset buttons on standard ATX PC's, and to read the status of the machine (Powered on or off, Power present @ PSU). I was building a 3-node cluster to test some cluster-filesystems for a client, and used 'wake-on-lan' to remotely boot the various cluster nodes when needed. This worked somewhat, but I was unable to reboot a hanging system, or see if a wake-on-lan packet actually arrived at the system. Doing some tests with a firmata sketch on an arduino proved that I could easily toggle the powerbutton and resetbutton on an ATX mainboard, bringing this project to life. Connect the arduino to a usb port on a working system (I used a openwrt based router). 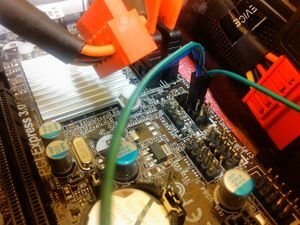 Connect the digital pins to the power and reset lines on an ATX mainboard. This page was last modified on 20 August 2013, at 22:10.